Would you like to send an SMS while you’re away from your mobile? Do you need to convert a notification email into a more convenient SMS? Our email to SMS service lets you conveniently send an SMS from your Voodoo SMS account via your email client. Instead of sending your message from our online SMS interface, you can convert your email to text by delivering your message to mobilenumber@emailtosms.net. Our platform will convert the email into an SMS and deliver it to the target number. Using our email to SMS service is easy, and all you need to do to get started is configure your email address in our user friendly platform. You can even use your email client to send SMS to more than one phone number at once by using several comma separated email addresses. When you send an email to our email domain, it’s automatically converted into an SMS format for delivery to a mobile number. There’s no need to worry about encoding or formatting on your end -- just enter your email and click “send” to deliver your email content as a text message. Do you need to send automatic SMS alerts to your customers, stakeholders or employees? Our email to text message service lets you replace standard emails with email to SMS addresses to deliver text messages straight from your CRM or project management tool. Instead of waiting hours for a response from team members and customers without mobile data access, you can deliver a simple, instant SMS to alert people to new developments and events. Whether you use a Mac or PC, our email to SMS service is designed to work with every email client, from popular web-based applications like Gmail to desktop applications like Mail for Mac and Microsoft Outlook. Do you need to send the same email to several people as a text message? Separate your list of recipient email addresses using commas, just like you would with a normal email, and we’ll send your email to every number as a standard format text message. Customising your messages with a unique Sender ID is simple. Just enter your Sender ID into your email’s subject line and our email to mobile system will make sure it populates the Sender field on the recipient’s mobile phone. Our email to SMS service is completely free to use for Voodoo SMS users, with no additional setup or service fees. Without paying anything extra, you’ll also get access to full delivery reports to track delivered and undelivered messages, as well as invalid phone numbers. Our email to SMS gateway simplifies the process of sending SMS to customers, employees and personal contacts. 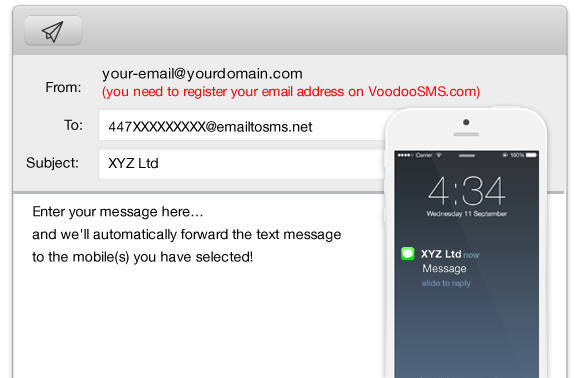 Create your Voodoo SMS account now and get started with our email to SMS service for everything from convenient personal messages to automated alerts and notifications.